It is recommended that those with a higher risk of eye disease have regular eye tests, in order to catch and treat any eye conditions with an early diagnosis, before symptoms develop. The general optometrist recommendation is that everyone should have their eyes tested roughly every two years. If you are concerned with any aspect of your vision, notice any sudden changes or unusual symptoms, speak with a doctor. 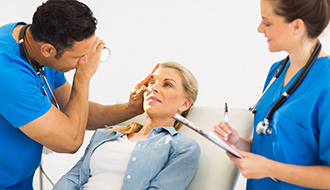 If you are concerned about your eye health, are noticing symptoms, or have a family history of eye problems, a doctor can help you understand your options. Make an appointment to see us today. I don’t have any vision problems. Should I have my eyes examined? It is a good idea to have an annual eye exam, even if your eyes are in good shape, and particularly if your family has a history of eye diseases or problems. What are the most common types of eye conditions? Glaucoma (where normal fluid pressure in the eyes increases), diabetic retinopathy (damage to the retina caused by diabetes), cataracts (cloudiness and hardening in the lens), and macular degeneration (age-related deterioration) are all commonly occurring eye disease, which are more common the older you get. There are a number of things you can do to protect your eye health. Quitting smoking reduces the risk of macular degeneration and cataracts. Regular exercise can keep high blood pressure and diabetes at bay, and keeps your arteries healthy, which can help you reduce the risk of vision loss. Wear sunglasses or wear a wide-brimmed hat in the sun. And protect your eyes when gardening! Even just wearing sunglasses in the garden can help you avoid injury or infection with branches, soil, or pond water.